Here are some pictures from the Bountiful Garden workshop that Susan's Cooking School presented at Munson-Williams-Proctor Arts Institute on October 21. Our thanks go to Barb Kane, April Oswald and the maintenance staff at MWPAI for their help in putting this workshop together. 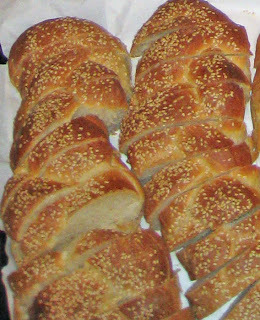 Above is the braided sesame bread. 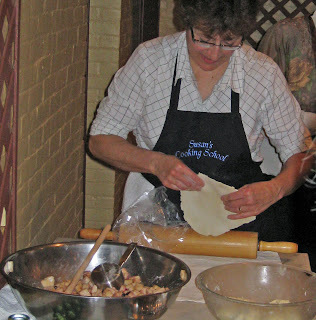 Here I am demonstrating the rolling of pastry dough for the fruit tarts. 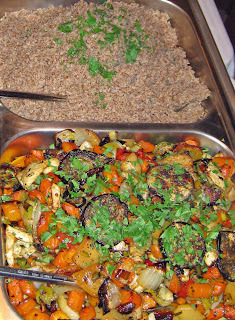 Below is a view of the oven roasted veggies and kasha pilaf. Below is the maple-cranberry chicken. Great culinary workshop in one of Utica's finest institutions! Let me have a peice!! @!